AmeriPlan CASH with a Simple Simple Simple Special JUMP START Promotion. It’s really Simple! 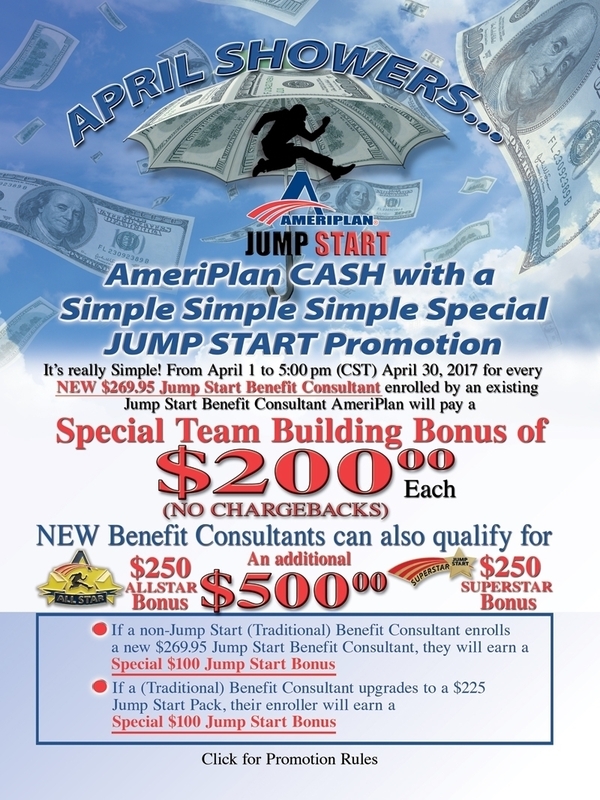 From April 1 to 5:00 pm (CST) April 30, 2017 for every NEW $269.95 Jump Start Benefit Consultant enrolled by an existing Jump Start Benefit Consultant AmeriPlan will pay a Special Team Building Bonus of $200 EACH! NEW Benefit Consultants can also qualify for an additional $500! 1.If a Jump Start Benefit Consultant personally enrolls a new $269.95 Jump Start Benefit Consultant, they will earn a special $200 Team Building Bonus INSTEAD OF a $50 Jump Start Bonus, Dental Plus Membership Commission, and Team Building Account Points. 2.If a Traditional (Regular) Benefit Consultant ($69.90) personally enrolls a new $269.95 Jump Start Benefit Consultant, they will earn a special $100 Jump Start Bonus. 3.If a Traditional (Regular) Benefit Consultant ($69.90) purchases a $225 Jump Start Pack, their enroller will earn a special $100 Jump Start Bonus and no Team Building Account Points. 4.Pre-purchased Jump Start Dental Plus membership inventory may only be used for Dental Plus Memberships and Traditional (Regular, $69.90) Benefit Consultants. *All standard contest rules and regulations apply.